My house and studio will be open to the public with an exhibition of recent paintings, drawings and prints. There will also be big reductions on older work, a chance to see a working artist's studio and opportunities to discuss upcoming workshops and private tuition. My paintings take a very long time to complete but I have a selection of new work that has not been seen anywhere else. 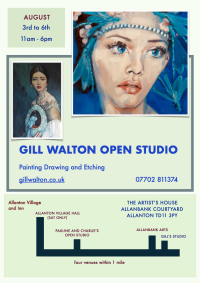 I am thrilled that my Open Studio event is getting bigger, I get hundreds of visitors through my doors and I hope that will include you this year. I would like to extend a warm welcome to everyone, there is a wheelchair accessible ramp to the ground floor. Children are welcome but parents be advised that there is a beautiful but unguarded pond in the back garden so please supervise the very small. Refreshments are on offer for a voluntary donation to Works+. It is an employability charity based in the Scottish Borders. They help young people aged 16-24 to gain a positive destination in life. Works+ is a SCIO, OSCR number SC048445. I am very pleased to be supporting them and 10% of any sales made over the weekend will go to this deserving organisation that almost had to close earlier this year because it's funding was withdrawn. this is an hour from Edinburgh or an hour and a half from Newcastle. Don't trust your Sat Navs, they put you on the right road but a quarter of a mile away. Follow signs for Allanton and Allanbank Arts. The number 260 bus runs between Berwick-upon-Tweed and Duns and drops off at the front gate.